How to Design / Make a Prototype (PCB) Printed Circuit Board | The Wonderful World of Microcontroller! The Experiment: Design / Make a Prototype PCB (Printed Circuit Board) for the experiments on this website. Use the FREE ExpressPCB design software to produce the printed circuit layout and then use the laser printer method to produce the board. Searching the internet found a lot of information on how to make a Printed Circuit Board using the laser printer method. Have made a lot of PCB but have not used the laser printer transfer method. So this will be a learning experiment. Saved a couple of magazines with glossy pages, read that glossy magazine paper is a good media to print the printed PCB layout on. But before using the glossy magazine paper will test to see how fast it dissolves in hot water. Step1: Design the printed circuit board layout using ExpressPCB Software. For single sided PC boards, design the layout on the bottom copper layer only. The layout can then be printed directly to paper, without having to make a mirror the image. Step2: Set printer properties to the maximum contrast and blackness possible, disable any form of scaling/resizing (e.g. “fit to page”). If the printer driver allows (set it to center of page) as it helps to get the right position using a non-standard size sheet. Now print the PCB layout on the glossy magazine paper. To save paper or transparency cut an 8.5×11 sheet in half. Note Another option: Is to print the PCB layout first to a .pdf from ExpressPCB. This has three benefited (but this step requires Adode Acrobat and MicrosoftXPS Document Writer Software). It is easy to share your .pdf PCB layout with other. Left click the “Adobe PDF Printer”, Select “Properties”, Go to “Printing Preferences” , Click the “Layout” Tab, Click the “Advanced” button, Then under “Document Options”, “Postscript Options”, Change Mirrored Output: from No to Yes. Now use the “Adobe PDF Printer” to print the PCB layout to a .pdf. Last use here to convert .xps back to a .pdf. Download and save the .pdf to your PC. Now back to Step2 to print the .pdf PCB layout. And here another paper option: Recently purchased some Laser Yellow A4 Heat Transfer Paper. Will comment on that after I use it. 8/13/2017 Note to Self: For some reason, had to set printer Page Scale to Fit to Printable Area and had to checked Auto rotate area center. The could have been caused by only using half page to save on yellow transfer paper or by the addition of a second PCB layout on the same sheet . 8/14/2017: Well going to make my first PCB using the Yellow Heat Transfer Paper. Print the PCB layout to the shiny side, (NOT THE PAPER SIDE). Will cut the board tomorrow and use the new inexpensive Amazon paper laminator to print the PCB layout on the PC board. Step 1: Print PCB Layout on shinny side off Laser Yellow Heat Transfer paper. Step 2: Transfer PCB Layout from heat transfer paper to PC board using clothes iron or paper laminator. Step 3: Etch the PC Board. Step 4: Clean off Laser Toner with Acetone, then cleaned with soft scrub cleanser. Step 5: Drill holes if needed. There you have it, Laser Yellow Heat Transfer paper work’s pretty well for making prototype PC board. Note: This is a much better option over using shinny magazine paper. Step3: Clean a piece of PC Board “It is essential that the copper surface is spotless”. Position the PCB printout over the copper surface and just tape the edge of the PCB printout to the edge of the PC board. Flip the board over and place a piece of paper over the top side of the board. Place a hot cloth iron (set to maximum heat cotton) on the top side of the PC board for about a (1)minute (this will preheats the board). Flip the board over and place a piece of paper over the PCB printout on the copper side of the PC board. Place the hot clothes iron on the copper side of the PC board for about three(3) minutes. Press down evenly on the iron and move it evenly every so often. Step4: Dropped the board in a bucket of hot water and started rubbing the paper off. This was the most time consuming part of the process. So all worked well, expected more problem but had none, so not bad for the first try. On the next PC board will not set the contrast as dark and not heat the board as long. looks like the toner squished out in some sections, noticed it on the letters some of the pads / traces. That’s probably a good indication that the toner is to thick. Software Used: ExpressPCB can also produce the finale PCB. Note: Used blue painters tape to hold down the PCB printout. Blue painters will not d-solve in water, luckily was able to pull off the tape without pulling off the PCB printout, but did notice that it was much harder removing the paper under the taped edge. Stop Using Ferric Chloride Etchant! Been using Ferric Chloride Etchant Solution to etch the PCB board, recently learn about another Etchant Solution option Muriatic/2% hydrogen peroxide. The acid to use is Muriatic acid (hydrochloric acid, 30 molar concentration), used to treat water in swimming pools, also available at local pool/hardware store in gallon jugs. Be very careful with this, wear gloves and eye protection. The correct mix to use is 2 parts of 2% hydrogen peroxide solution and 1 part Muriatic acid. Add the acid last, taking care not to breathe the fumes. This will make an etchant solution that will supply its own heat (it will get slightly warm when mixed). Much cleaner and less expensive than ferric chloride, which is a messy solution that can stain everything. 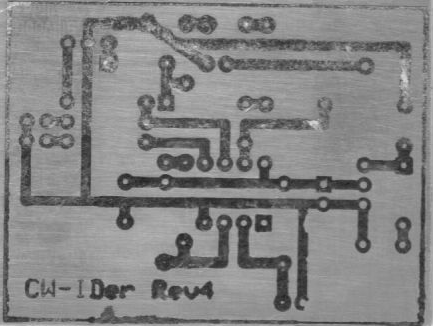 The Dry Photosensitive resist require a negative PCB layout. When exposing the resist to light, direct sunlight for 7.5 seconds works well here. At the hardware store, you can get Arm & Hammer (brand) washing soda. This is sodium carbonate, not to be confused with sodium hydroxide used in Drano. Use 1/2 TEAspoon (TSP) per 8 oz of hot water for developing; After etching, the resist can be stripped with a more concentrated HOT sodium carbonate solution at a concentration of 1 TEAspoon per cup of water. Allowing this to sit on the resist for a few minutes will cause the resist to bubble up and lift away from the copper.